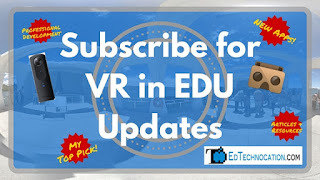 EdTechnocation: Part 1: Thinglink is Bringing VR to Every Classroom! In my constant exploration for virtual reality resources and tools, I think I've found the holy grail for VR creation! The Thinglink 360° & VR Tool is one of the easiest and most classroom friendly. I've put together a four part blog series. 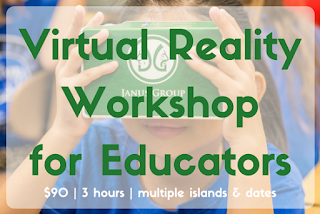 In part 1 find out how Thinglink is bringing VR to every classroom. 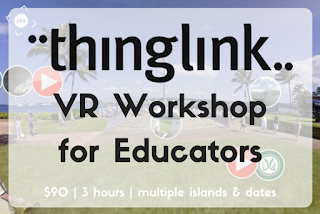 Thinglink is bringing VR to every classroom! Thinglink is well known for its interactive image and video editing tools. Like the example above, with a standard image you can embed "tags" to include interactive content like links, images, and videos. Thinglink took that same concept and applied it to 360° images, allowing anyone to create their very own interactive virtual reality experiences! The above Thinglink VR is a 360° virtual field trip of the Pearl Harbor Memorial that I created as an example, complete with audio recordings, YouTube videos, images, text, and even a Google Doc to cite the sources. All of the content included in this experience were borrowed from the internet (following proper creative commons guidelines). Even the 360° image of the memorial was borrowed, which I found on Google Street View. And what I find to be the most amazing thing about this is that I created the whole experience through a website; no special software required! Cost Disclaimer: Of course, a tool as amazing as Thinglink VR isn't free. But it is certainly affordable for any teacher or school! You get access to the basic image & video editor with a free Thinglink account. But, if you want access to the 360° & VR Editor you need to purchase, at minimum, a Teacher Premium license for $120 per year. That may seem like a big price tag for just one teacher, but a Premium account actually allows you to give up to 350 students access to the VR editor as well. And you are able to create up to 10 classes. A thousand students is usually way more than enough to cover one school. But, if you do have more than 350 students or if your school wants the option to create more classes, they do have custom quotes, group deals, and packages to choose from as well. Check out all the details on cost here.